Supporters cheer as they wait for President-elect Donald Trump to give his acceptance speech during his election night rally, Nov. 9, 2016, in New York. The United States of America appears less united than ever, based on evidence drawn from conversations with voters, showing how deep and surprising divisions between blocs of the American electorate enabled Republican nominee Donald Trump’s stunning election upset and earned him the presidency. Most credible projections had given Democrat Hillary Clinton a clear path to the finish line. Polling expert Nate Silver, for example, predicted on his website that Clinton had a 72 percent chance of victory as Election Day dawned. That early estimate was based, to a degree, on assumptions that traditional supporters of Democratic candidates, such as African-American and Hispanic voters, would give Clinton a strong boost. But exit polls conducted by the Pew Research Center the morning after the vote show that Clinton could not match the strong support President Barack Obama won from those two demographic groups. In 2008, Obama had a 91 percentage point advantage among African-American voters over his Republican opponent, Senator John McCain. This year Clinton had a strong lead over Trump with the same group. But her edge was smaller, at 80 percentage points. And Trump, who launched his presidential campaign by calling Mexican immigrants rapists and vowing to make Mexico pay for a giant border wall, managed to win more Hispanic votes than Mitt Romney did in 2012. 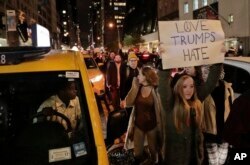 Pedestrians cheer as pro-Trump supporters, gather to voice their support for Trump's election as president, Nov. 9, 2016, outside Trump Tower in New York. Democratic pollster Geoff Garin told Politico it’s possible that those reading the polls assumed — wrongly — that steadily growing diversity in the U.S. population would automatically help Clinton. “There was too great a belief that demographics are destiny, and that demographics would lead to a certain outcome,” he said. That same belief appears to have applied to women, who did not flock to Clinton in the overwhelming numbers that Silver’s blog predicted just a month before the vote. In reality, Clinton won 54 percent of the female vote, one point less than Obama in 2012. Why were the polls so wrong? The only poll that did not predict a Clinton landslide, and which was widely debunked for it — the USC Dornsife/Los Angeles Times poll — said perhaps it was a reporting bias. “Women who said they backed Trump were particularly less likely to say they would be comfortable talking to a pollster about their vote,” that survey concluded. Trump’s main boost, unsurprisingly, came from the group that has vocally supported him all along: non-college-educated white voters. NBC’s exit poll found that 65 percent of white non-college-educated voters chose Trump, compared with 29 percent who voted for Clinton. That sort of margin hasn’t been seen since Ronald Reagan’s 1984 victory over Walter Mondale. Trump himself mentioned this group, which he called the “forgotten people” in his acceptance speech Wednesday morning. Protesters march along 57th Street toward Trump Tower, Nov. 9, 2016, in New York, in opposition of Donald Trump's presidential election victory. In the exhausted aftermath of this bruising election, Clinton and Trump seemed to agree on one thing: the need for unity. Trump took a magnanimous tone in his acceptance speech, leaving behind his vitriol against Clinton and calling for togetherness.